Ankylosing Spondylitis (AS) is a sero negative, progressive chronic inflammatory disease. Over 90% of patients are HLA-B27 positive. It starts with back pain and a general feeling of ill health which eventually leads to stiffening and inability to bend the spine. In worst cases, the spine becomes like a solid rod of bone between the skull, neck and pelvis hence named as POKER'S BACK. Over 90% of patients possess HLA-B27 (Human Leucocyte Antigen). AS results in bony ankylosis beginning with ossification of ligaments and tendons of the spine, particularly at junctions with bones. ossification usually starts at the dorso lumbar region or sacro iliac joint. Around the joint there is loss of cortex and erosions with consequent widening of joint space. Later in the disease process, there is sclerosis and finally ankylosis. The exact cause of Ankylosing Spondylitis (AS) is unknown but there are two factors which are thought to be the cause of this condition. Prevalence varies in different races, in white population it is between 1-10 patients per 1000 persons. The age of onset is commonly in 18-30 but can start at any age. males are more commonly affected than females, usually the ratio is 3:1. The first degree relatives of the patient of AS have more chances to develop this condition. Synovitis Initially, the inflammation of the synovium occur, which may be identical histologically to that in rheumatoid arthritis(RA). Mostly commonly the synovitis starts, firstly from the sacroiliac joints followed by the other region of the spine. Enthesopathy This term refers to an inflammatory reaction at the enthesis which is the zone of ligamentous attachment to the bone, and this is the characteristic feature of AS that occurs commonly in the spine and near the pelvis. Cartilage Destruction and Bony Erosion This occur due to synovitis and the inflammation of the ligament and the capsules. The cartilage of the joint gets destroyed, and becomes rough and the bony erosion occurs. Ossification All the above factors lead to the formation of new bones at these areas, and bridging takes place between the vertebral bodies, usually from the edge of one body to that of the next, along the outer layer of the disc. This typical phenomenon is known as the marginal syndesmophyte formation. Ossification also occurs in the anterior and posterior longitudinal ligament and also in other ligaments of the spine. Ankylosis All the features of the above and most important the ossification part, results into fusion of all the vertebrae of the spine, and this condition is called bamboo spine. The formation of the syndesmophytes starts usually from the dorso-lumbar region. 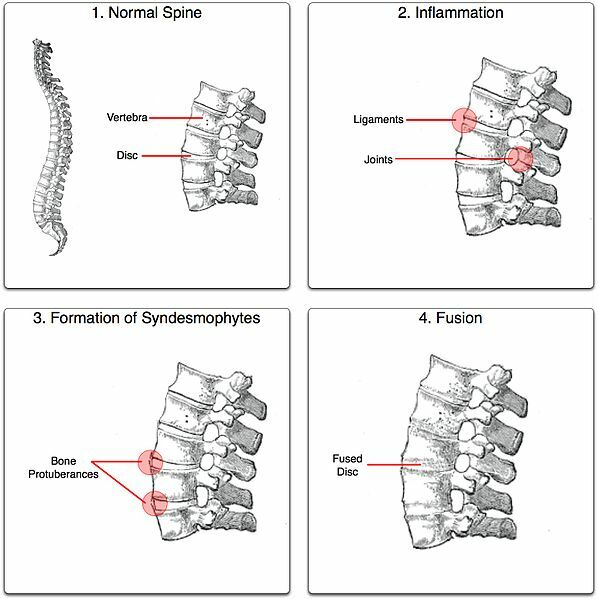 After bony fusion the pain may subside, leaving the spine permanently stiff. Aortic regurgitation- Heart disease conduction defects. Myelopathy secondary to atlanto-axial subluxation. Painful heel or achilles tendinitis. Reduced chest expansion and vital capacity. Early diagnosis is important in order to start on the Ankylosing Spondylitis treatment program. Making an accurate diagnosis for ankylosing spondylitis can be difficult, however, due to the fact that the symptoms of ankylosing spondylitis are so similar to other, more common back problems and the symptoms and signs occur slowly over a period of years. Erythrocyte Sedimentation Rate The sedimentation rate is generally raised in proportion to the inflammatory activity in about 70% of patients. HLA-B27 test This is positive in about 95% of patients. Haemoglobin Normochromic or normocytic anaemia may occur but in contrast to RA, patients with active disease often have a normal haemoglobin and blood film. Synovial Fluid Contains a moderate number of mononuclear leucocytes in contrast to the increased polymorphonuclear leucocyte count of RA fluid. Rheumatoid Factor Rheumatoid factors are absent. Pulmonary Function Tests In patients with thoracic involvement usually show diminished vital and total lung capacity, increased residual volume and functional residual volume. Flow measurements are usually normal. Nuclear scans Technitium stannous pyrophosphate bone scans, can often detect areas of active inflammation in AS, before standard changes are present. Sclerosis of the ilium and sacrum on either side of the joint. Hazziness of the joint margins which later on show erosions. Narrowing of joint space which may progress to fusion. When ankylosis is complete, the periarticular sclerosis fades. Sometimes leaving the evidence of the previous joint line, known as Ghost joint. Squarring of the vertebral bodies i.e loss of normal anterior concavity on the lateral view. Syndesmophyte formation usually first seen at the thoraco-lumbar level. Arthritic changes and later apophysial joint fusion occurs which is best seen in cervical spine. Calcification of the paraspinal ligaments. The romanus sign, is the erosion surrounded by sclerosis at the vertebral body margin. 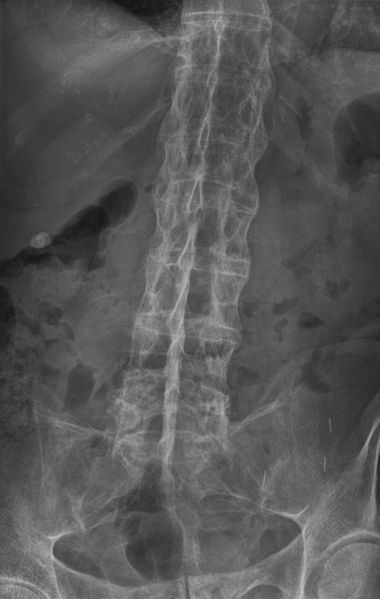 The characteristic bamboo spine results from syndesmophyte or paraspinal ligament calcification around the normal disc space. Spondylodiscitis may develop in the lower thoracic and upper lumbar segments. Erosive changes in the anterior vertebral bodies adjacent to the disc, which become progressively destroyed and causes angulation of the spine. The appearance may resemble infection or trauma but is probably part of the spondylitic process. The course of AS varies. Symptoms may be persistant or intermittent over the years or we can say that the disease is present throughout the life but does not shorten the life of the patient. AS shows a wide range of severity. In some individuals, the disease is mild and although it may show periods of exacerbation with increased pain and stiffness, there is little permanent limitation of the spine. At the other end, the disease may progress or may be uncontrolled, causing marked and permanent spinal rigidity. Since patients with spinal pain tend to flex the back and neck, and ankylosis occurs in this position producing variable degrees of a fixed 'C' shaped deformity. Hip involvement is prognostically important, because it adds to the difficulty in mobility and further impairs functions. Most patients who maintain disciplined exercise, posture programme and take anti-inflammatory medications i.e proper Ankylosing Spondylitis treatment plan are able to lead relatively normal and active life with minor adjustments in life style. Less than 10% develop crippling disease. 2. Maintain maximum skeletal mobility. Nonsteroidal anti-inflammatory drugs (NSAIDs), like naproxen (Naprosyn) or indomethacin (Indocin) are used to relieve pain and stiffness. In severe cases, sulfasalazine (Azulfidine), another drug to reduce inflammation, or methotrexate (Rheumatrex), an immune-suppressing drug, is recommended. In cases where chronic therapy is needed, potential drug side effects must be taken into consideration. Corticosteroid drugs are effective in relieving symptoms, but are usually reserved for severe cases that do not improve when NSAIDs are used. To avoid potential side effects, treatment with corticosteroids is usually limited to a short amount of time with a gradual weaning from the drug. Corticosteroid therapy or medications to suppress the immune system may be prescribed to control various symptoms. Some health care professionals use cytotoxic drugs (drugs that block cell growth) in people who do not respond well to corticosteroids or who are dependent on high doses of corticosteroids. Drugs called TNF-inhibitors have been shown to improve the symptoms of ankylosing spondylitis. Surgery may be performed if pain or joint damage is severe. Surgery plays a very small part in the management of this condition. About 6% of people with AS need to have a hip replaced. This will successfully restore mobility and eliminate pain of the damaged joint. In rare cases surgery is used to restore a straighter posture of the spine and neck to people who have become severely stooped. The physiotherapy management consists of the physical examination or assessment of the patient and the physiotherapy methods used for Ankylosing Spondylitis Treatment. i) Sacroiliac Joint: There are certain simple tests, which may be positive if the SI joint is affected. SI joint tenderness and paraspinal muscle spasm. Lateral compression of the pelvis with the examiner's hand will elicit pain. Gaenslen sign- Instruct the patient to lie supine on the edge of the examining table with knee flexed and with one buttock over the edge. Ask the patient to drop the unsupported leg off the table, this procedure will elicit pain in the contralateral SI joint by stretching it. SLR test (straight leg raising test)- The patient is in supine lying position and then asked to lift the leg upwards with his knee extended. By this, pain is felt on the affected side at the SI joint. Pump Handle Test- The patient is in supine lying and then, do the flexion of the hip and knee and then give some extra pressure as to touch the knee to the opposite side of the shoulder. By this procedure, the pain is felt on affected side. ii) Spine: Loss of spinal motion can be detected quite early in most cases. As mentioned before early diagnosis is important in order to start on the Ankylosing Spondylitis treatment program. The cervical spine also become stiff and flexion deformity develops. The measurement is done by goniometry. Tragus to wall test- For the flexion deformity, measurement can be made from the wall behind and the tragus of the ear. Fleche Test- This test detects an early involvement of the cervical spine. Ask the patient to stand on the heel and back touched on the wall and then ask the patient to touch his back of the head to the wall and at the same time the chin is not moved upward. If the patient can't do this, shows the involvement of the cervical spine. Lumbar or spinal forward flexion (Schobere test). Combined hip and spinal flexion. iii) Examination of peripheral joint movements: All the joints are measured for active and passive range of motion, done with the help of goniometer. Commonly involved joints are temporomandibular , hip, knee and shoulder. iv) Lung Function Test: Early involvement of the costo-vertebral joints in the disease process makes careful spirometry and measurement of chest cage movement essential. Less than 5cm of chest expansion during inspiration in an adult is considered to be reduced. v) Measurement of Postural Deformity: In this, loss of secondary spinal curve occurs, first the lumbar lordosis is lost and then the cervical lordosis and increase of thoracic curve develops. So the patients spine become rounded. It is advisable to make objective measurement of these. In physiotherapy department using spondylometer helps in measurement of postural deformity. Regular physiotherapy is very essential in the management of a patient of AS and only physiotherapist is the person who can help the patient to fight with the disease. Maintain the mobility of joints affected like spine, hip, thorax, shoulder etc. Increase chest expansion and vital capacity. To maintain and improve physical endurance. Make the exercise part of your daily routine. Try to do a complete set of exercises at least twice daily at a time convenient to you. Heat and cold application amy precede exercises to enhance relaxation and decrease pain. Perform only those exercises given to you by your physiotherapist. Perform exercises on a firm surface. Exercise slowly with a smooth motion, do not rush. Avoid holding your breath while exercising. Modify the exercise regime during an acute attack and contact your physical therapist if you have any complaints or problems with the exercises. Maintaining the mobility of joints, by giving mobility exercises to particular joints, which are affected like, spine, hip, shoulder, thoracic cage are essential in Ankylosing Spondylitis Treatment. Maintenance of the mobility is very important and the basic aim is that all the joints are moved to their maximum limit and by this, we can delay the process of ankylosis. The relief of pain and muscle spasm. The maintenance or increase in range of motion of joints. The strengthening of weak muscles and an increase in their tolerances to exercise. The encouragement of functional activities. The maintenance and improvement of balance, co-ordination and posture. The spondylitic patient should always be conscious of his posture while sitting, standing and walking patient should maintain the erect posture during these activities. This helps to prevent and correct deformity and thus help in Ankylosing Spondylitis Treatment. Sleeping should occur in prone position or supine on a firm mattress with a thin or no pillow by this, the spine remain in extended position and not in flexion. The design of chairs is important particularly for those who spend most of their working hours sitting at desk. Low arm chair should be avoided, an upright chair with some cushioning to support the lower lumber spine is better. Adjust the height of the working table and ensure that the patient does not stoop on that. Avoidance of prolonged immobilisation or bed rest, because of this, the spinal extensors become weak and by this the extended position of the spine is not retained. Deep breathing exercises are encouraged. Ballooning exercise is also very useful in Ankylosing Spondylitis Treatment. They increase the vital capacity of the lung. Thoracic mobility exercises. Endurance is a quality which develops in response to repetitive contraction. Endurance is improved by working muscles against light resistance and high repetition i.e for longer time. The patient can give support to the other member of the class that is another patient. Shared problems providing a good medium for patient's education and latest information about the disease process. Development of competitiveness and motivational aspects. Ankylosing Spondylitis. National Institute of Arthritis & Musculoskeletal & Skin diseases.